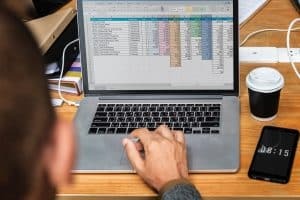 The reasons behind sales and marketing professionals deciding to outsource prospect list building are mostly the lack of time and internal resources backed by a wish to focus on more important tasks. Sure, some will say that there are benefits for prospect list building in-house. But as you may know, there is no magical place where you can get prospects – a lot of hard work is invested in doing this the right way. The only question that remains is – do you have time to do it yourself? If the answer is no, then you already know the solution to your problem – outsourcing. But let’s say you decided to outsource – should you choose a freelancer or a specialized agency? Both options, outsourcing your targeted list building to a freelancer and to a specialized agency have their ups and downs, but it mostly comes down to a good old principle – value for money. The main reason for outsourcing to a freelancer could just be an affordable service. You will log into Upwork, for example, find your preferable prospect list building professional and explain your offer and your price. As long as you communicate your goals clearly and give detailed instructions, providing you selected a good candidate, your freelance outsourcing should be a breeze. The other main reason for hiring a freelancer for prospect list building is that there is no paperwork needed, no contract approval and signing. It can all be done within minutes if you’re really in a hurry to get the leads. This further means that they are great for short term projects. You can get them on board, they can do the work and the second they’re done they will be out. Let’s assume the freelancer is not a native English speaker – you may have trouble explaining your needs and they may have trouble understanding. The end result is not getting what you need. However, even if the freelancer is a native or advanced English speaker, they still may not be business oriented. Meaning, they can’t advise you on how to improve your targeted list building efforts. Freelancers may not know the entire sales and marketing process and how their efforts need to correlate with content marketing, social media, customer profiling, etc. Unfortunately or understandably, most freelancers will do only what is asked of them and what they’re paid for. That’s precisely why you have to make sure to clearly inform them of everything that you need delivered as well as the exact process of building the targeted lists. 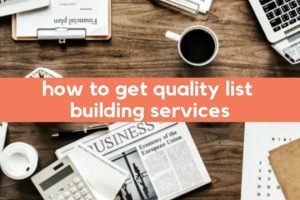 The quality of leads will inevitably vary from freelancer to freelancer and their previous prospect list building experience. Subsequently, you may find yourself filling up your CRM with bad data that will sooner than later have to be updated. The freelancers will try their best to complete the work they agreed upon, but there’s only so much they can do on their own. But what happens when you suddenly need a large number of prospects that one freelancer simply can’t provide? You guessed it – you will have to hire multiple freelancers, educate each new hire and then answer their questions and coordinate their tasks accordingly. If your job title is not managerial, you will quickly find out how tiresome managing a team can be. You would have to personally coordinate a team of freelancers who are all in different locations and time zones, taking up many time slots in your day. And let’s just hope none of them quit because then you go into a whole other nightmare – replacing them. This means that you have wasted your time educating and coordinating one freelancer, just to have to do it all over again with someone else – when you actually manage to find them. 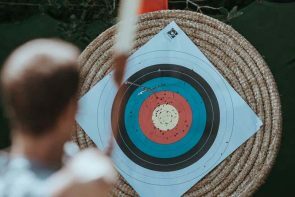 The main reason people are not sure whether or not to outsource to a targeted list building agency is that they usually assume that it will take up a lot of their time. Right after the terms are agreed upon, the contract between the client and the targeted list building agency can be signed within hours. The specialized agency will do its best to help you determine your Ideal Buying persona, if you already don’t have one, or find the companies similar to the ones already on your list of clients. Prospect list building agencies can even help you write your email messaging and send it in your name. They can automate the entire process, manage your CRM and track campaign success to the point where you only have to reply to your prospect’s email. What is best, these agencies usually have their own team of expert researchers in finding the perfect prospects for your business. It’s up to the agency to dedicate a certain number of people that will work on your project and determine, with or without your input, how many industries or verticals they should cover. It’s important to note that because of all the experience they have accumulated over their operating years, they use more resources in searching for prospects meaning that they are familiar with ‘’smaller’’ markets such as Latin America, China, Japan, Australia, some parts of Europe, etc. What is more, any good lead list building agency will provide you with an Account Manager i.e. a single point of contact who you can rely on for all of your questions, changes in strategy and number of leads, additional data points and, more importantly, advice. They will ask you right away what data points you need (job title, department, email, phone, etc) and make sure that you get as much information as possible. The downside, of course, is that the better the agency – the more you’ll have to invest. If you are looking to get a prospect database, scraped off the web, it sounds a lot cheaper per lead, but when you count in outdated contacts or chasing wrong deals it will be more expensive. If on the other side, you want highly targeted hand-picked prospects that will be a perfect fit for your business, this investment will bring higher returns. Can You Find Leads Quickly With Advanced Sales Tools? There are numerous online prospect lists and Account Based Marketing tools that can help you get prospects, and even social media will help you now, but you can never be sure of their quality. Nevertheless, high-quality prospects are the foundation of your business, especially for startups. Tools can be quite limiting when searching for prospects, especially compared to actual humans. There are certain criteria that you can put in, and that’s about it – no footnotes allowed. On top of that, they can be imprecise when it comes to targeting which leads to questionable prospect quality and huge bounce rates. Hiring a specialized prospect list building agency entails a higher level of flexibility and adaptability according to your brief. For example, let’s say that your ideal buyer persona has at least 20 branches, but if it’s a hospital then 4 would be enough, a SaaS tool doesn’t give you that choice. You will find yourself in a mess except you wasted your time instead of leveraging someone else’s. Best advice would be to take a look at your budget and see what you can afford. If you can afford a targeted list building agency and high-quality custom contact list – go for it. It will pay off immensely. If you have just enough to hire a freelancer, make sure you create a precise brief and you can start your search. If you need any more help with prospect list building or – let us know. There are numerous ways in which you can get leads. If you decide to outsource lead list building – you are faced with either paying per lead or per hour. Find out how to get your moneys worth depending on your situation.